When were they built and Who built the built the Ancient Egyptian Pyramids? History - Why were Ancient Egyptian Pyramids built? What was inside the Ancient Egyptian Pyramids? The construction of the Ancient Egyptian Pyramids have amazed people throughout the centuries. Who built the Ancient Egyptian pyramids? Why were they built? How were they built? Who built them? What was there purpose? What was inside the Ancient Egyptian pyramids? These are just some of the many questions which surround the Ancient Egyptian pyramids. History of the Pyramids - When were the pyramids built and Who built the built the Ancient Egyptian Pyramids? The history of the pyramid and their construction was intermittent. Who built the built the Ancient Egyptian them and when were they built? The first Egyptian pyramid was built called the Step Pyramid, at Saqqara for King Djoser (2668 - 2649 who was one of the kings of the 3rd Dynasty. The Golden Age of the pyramids only lasted for about 100 years. The Golden Age of the pyramids was when the great pyramids at Giza were constructed during the historical period of the Old Kingdom (2686 BC - 2181 BC). The practise was abandoned during the First Intermediate Period (2181 BC - 2040 BC). During the Middle Kingdom (2040 BC - 1782 BC) some of the Pharaohs started building pyramids again. But by the period of the New Kingdom (1570 BC - 1070 BC) the tradition and history of building the pyramid monument finally ended and the Pharaohs of Egypt were then buried in the rock cut tombs in the Valley of the Kings near Thebes. The history of the pyramids have been lost over time. It is not certain why the pyramids were built as monuments to the Pharaohs but many Egyptologists believe that they were linked the religion and beliefs of the Ancient Egyptians. The early Egyptian priests evolved a creation myth, or Cosmogony, to explain how some of the Gods and Goddesses came into being. The Sun God Ra (as Atum) was believed to have risen from the primeval ocean to the first, conical-shaped, mound of earth and then created the world. The Ancient Egyptians therefore revered the mound as an image of creation. The first rays of the sun fell on Sun God Ra (as Atum) marking the way to heaven by ascending the rays of the sun. The pyramids - mounds of masonary - were a material representation of the rays of the sun. It is easy to imagine how Ancient Egyptians would see the association of the pyramid and the sun and how the structure could be a means whereby the dead king could ascend to heaven. The sun lead the way to the heavens but where was the final destination? The most important group of stars to the Ancient Egyptians were called the 'Indestructibles' (in the bowl of Ursa Minor & Ursa Major). The Indestructibles were the two bright stars that always could be seen circling the North Pole. These stars circled an unmoveable area which the Ancient Egyptians believed was heaven. The positioning of the pyramids were of great importance as they were built to align north with a single, perfectly aligned vent, or shaft which was built into the internal structure of the pyramids pointing directly to the area they believed was heaven. The shaft led, at an angle, from the burial chamber to the outside. The soul of the Pharaoh was thus able to travel from the burial chamber, up the shaft, on the path to heaven. The Pyramids were therefore believed to be Resurrection vehicles - a 'Stargate' leading to heaven and eternal life. What was inside the Ancient Egyptian Pyramids? 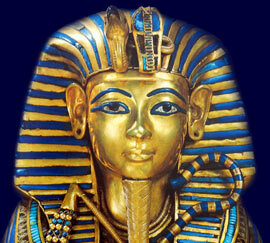 The purpose of the pyramids was to create a monumental tomb for the Pharaoh. Inside the pyramid were tomb chambers, ante-rooms and chambers, ventilation shafts and access tunnels. However, the building of the sphinx has not been effectively dated so cannot be attributed to any of these Pharaohs.